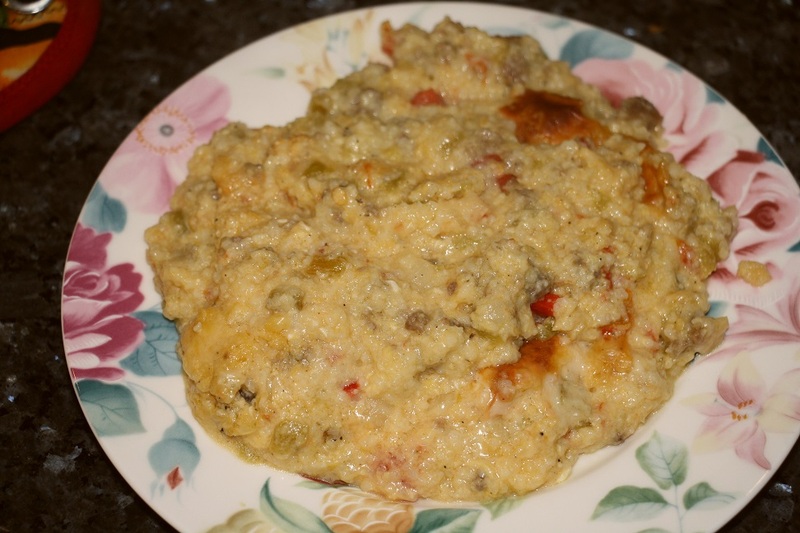 While organizing the pull out pantry recently, I discovered that we had several containers of quick grits in addition to the stone ground ones in the freezer and when I began thinking about another breakfast casserole, I wanted it to include grits. 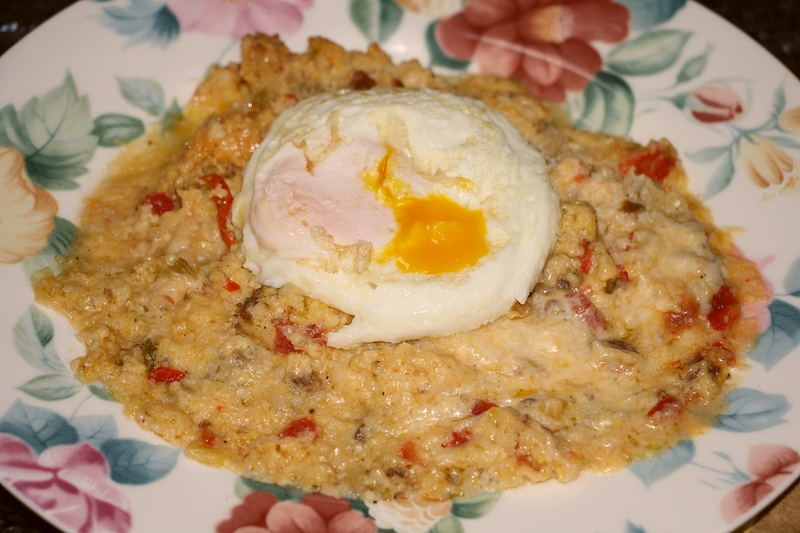 I looked through my saved blogger recipes and sure enough found just what I was looking for in the form of Sausage & Ranch Grits Casserole from Steph’s Plain Chicken Blog but since I had no ranch dressing, I decided to make a southwestern version. I did another search and found a recipe for Mexican grits so I used both recipes and things I wanted in it to get the following. Note - The directions are based upon how I will do it next time based on some mistakes I made this time, such as adding the cheese at the beginning, so the pics may not match the directions. 1. 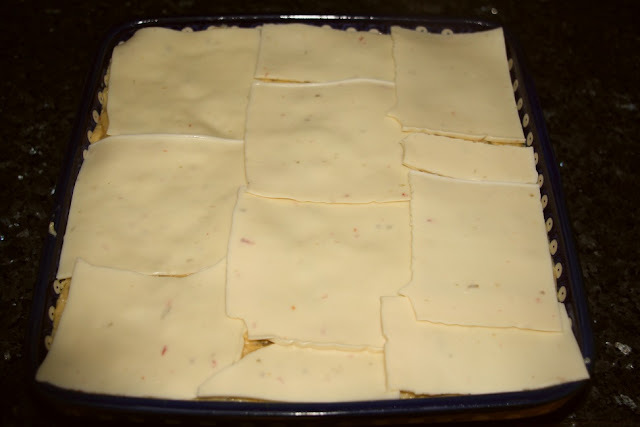 Preheat oven to 350° F. Lightly spray a 11"x11" (or10”x12”or 9”x13”) dish with cooking spray. Set aside. 2. In a large skillet, cook sausage, onion, pepper, and garlic over medium heat until no longer pink and most moisture is gone then add the chiles and Rotel to a well in the skillet center to cook a little of the liquid out of it – about 5 minutes – then mix it all together. Drain fat if necessary. 3. In a large saucepan, add chicken stock; bring to a boil. Slowly stir in grits. Reduce heat to medium-low; cook, covered, 5 to 7 minutes or until thickened, stirring occasionally. I left it on the heat at this point as I thought the grits were a little too runny. 5. Transfer grits mixture to a prepared dish. 6. Bake, uncovered for 45 minutes (or more) then add cheese topping and bake for 10-15 minutes (I put the cheese on first and it was browning after 30 minutes so I covered it then and it stuck to the foil - bad idea). Before adding the cheese, check center of casserole to be sure it is plenty hot. 7.Remove from oven and let rest about 5 minutes before serving but since it is grits it still won’t come out as a cube - I guess the amount of liquid could be lowered to see if can be done, but I prefer creamy grits. If not baked immediately, remove from the refrigerator 30 minutes before baking. Increase baking time by at least 15 minutes. I had it for supper and absolutely loved it - and I cannot imagine you would not enjoy it. Whether made as a casserole or just cooked in a pan, if I owned a restaurant, this would be offered as side dish for every meal. And what could I do to make it even better when reheated for breakfast? I would normally use two eggs but wanted to show the grits. While I loved it, I believe next time I’ll try Mexican Chorizo to make it even more southwestern and see if I like it better - I still have lots of grits to use up. The Mexican Chorizo I really love, but just never was able to acquire a taste of eating grits. You keep breakfast interesting. Our favorite meal. I have chorizo I need to use and grits coming out the ears. Now I know what tomorrow's dinner will be. Thanks for the inspiration. Love the shot of the egg on top. Looks delish. I've only had grits once and loved them. This casserole looks hearty and delicious - love it with the egg on there!